I’ve been living in Thailand coming up to a year in December and although in the tropics, I’ve never really seen too much rain here. About my 2nd ever trip to Thailand, I think it rained everyday, and although I’ve seen bad bouts of weather (raining for say a week or whatever), it’s always been pretty good for me. This year, as with many countries, Thailand has seen unusually high levels of flooding. Almost no point of Thailand has been untouched. For months the northern part of Thailand (Issan, where Fah’s family is from), and Bangkok have had weather warnings, flash flooding, and rain for weeks on end. We’ve been in Bangkok for over two weeks now and other than for an hour or two some afternoons, we’ve seen very little rain. 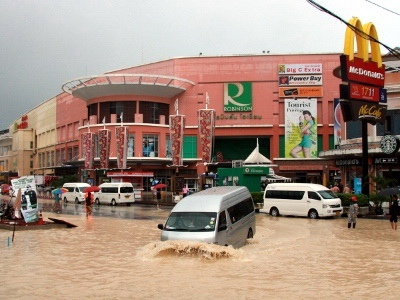 But right now, Phuket (notably Patong) is experiencing bad flooding. And I’m in beautiful (sic) Bangkok where the weather has been fine. We are due to go home in a few days, however we may extend our stay here a little longer. An associated article (found below) talks about Phuket’s last period of bad flooding. This was back in March. At that time I’d flown home to Australia for a few weeks and so I missed out on the bad weather. I missed the flooding back in Australia (shortly after coming here), I’ve missed the flooding in Phuket when I returned to Australia, I’ve missed the greater flooding of Thailand (including Bangkok), when I was in Phuket, and now that I’m in Bangkok, I’ve missed it all again! I spoke too soon. The day after I posted, it’s rained every afternoon since!